Parma Calcio 1913 (Società Sportiva Dilettantistica) reflects the rich heritage of a long line of major football clubs that have represented our city and our region for over a century on the football pitches of Italy and Europe, from provincial countrysides to metropolitan cities. The organization originated as Verdi Football Club, lasting just three months from July to September 1913. It was created exclusively to celebrate the centennial of the birth of composer Giuseppe Verdi, a native of Parma, but blossomed into the Parma Football Club. This new club was founded on December 16, 1913 and was represented by the crusader cross or crociata on the squad’s kits (a black cross on a white background). Over the next few decades, the club assumed a variety of different names and ownerships (Parma Associazione Sportiva, Parma Football Club, Associazione Calcio Parmense, Parma Associazione Calcio, and Parma Football Club S.p.A). After bankruptcy under the previous ownership, Parma FC S.p.A became Parma Calcio 1913. 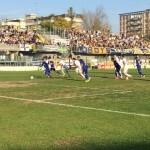 This incarnation began in the Lega Nazionale Dilettanti or the National Amateur League, with the first team participating in the Serie D during the 2015-16 season. The team’s newest initiative is to earn back the respect and honor that a team with eight national and continental trophies deserves (3 Coppa Italia, 2 UEFA cups, 1 European Super Cup, 1 Supercoppa Italiana and 1 European Cup Winners’ Cup), as well as to display the decency and the identity of the city of Parma and its fans.